The Environmental Hydraulics Laboratory possesses a multifunctional large scale wave flume. Located in the Québec Metro High Tech Park, the flume is 120 m long and has a depth and a width of 5 m. It is the largest of its kind in North America. The flume is designed for modeling the interactions of waves, tides, currents, and sediment transport. This equipment enables researchers to develop sustainable approaches to coastal management for controlling erosion due to natural causes and by climate change. The flume has numerous fundamental and applied research investigation opportunities. The wavemaker of the flume is a piston-type mechanism with a max. stroke length of 4 m and velocity of 4 m/s. 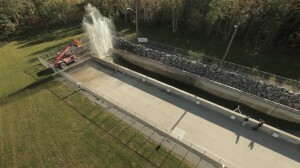 The flume can be set up with a variety of initial conditions, including regular/irregular waves, and user-defined functions. For example, landslide- or earthquake-generated waves. Large amplitude waves reaching the top of the flume walls can be produced with water depths ranging from 2.5–3.5 m with wave periods of 3–10 s.
A bidirectional water circulation system allows for current flow studies as well as wave-current interaction studies. A max. near 1 m/s can be generated and increased by narrowing the flume with artificial inner walls. Test sections can be located between 45 and 110 m from the wave maker. Monitoring stations (14) spaced by 5 m are mounted along the flume and can be equipped with a wide variety of measurement instruments such as current meters, acoustic doppler current profilers (Aquadopp, mini-ADP), turbidity sensors (OBS3+), low and high range pressure sensors (Kistler, PCB, RBR). In addition to these stations, a number of movable sensors can be mounted at any strategic place along the wave flume to mesure amplitudes (acoustic sensors), wave impact pressures on coastal structures, pore pressures, etc. The flume is equipped with a gantry crane and has a water transfer system connected to a reservoir of 3500 m³ tank.